New York City is one of my favourite places I’ve ever been to, and I’m pretty much obsessed with anything and everything New York. I have a canvas above my bed of the NYC skyline, a cushion with a similar design, and, of course, a couple of NYC tops, to bring fashion into my collection. I knew I had to get this top as soon as I saw it, as it’s unlike anything else I own. The NYC lettering on the front immediately stood out to me, as the black and white design is eye-catching and bold, and adds a real chic yet casual look to the top. 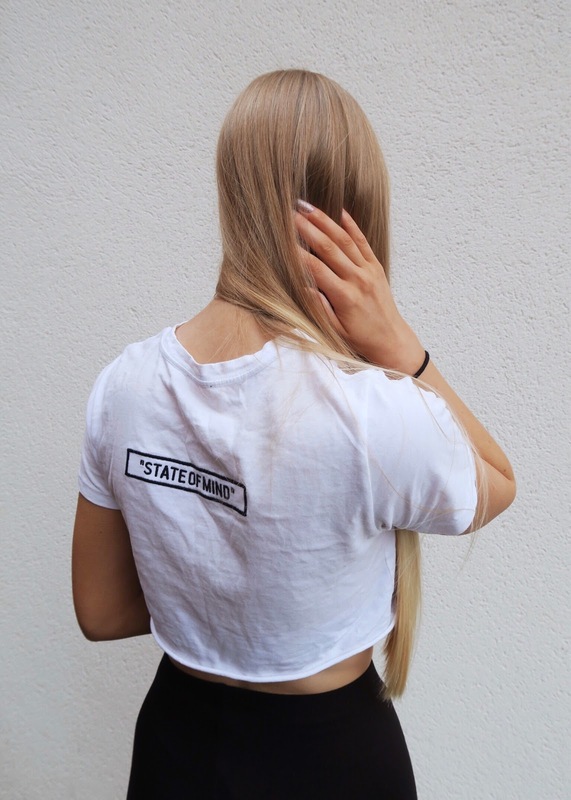 One of my favourite things about this crop top is the detail on the back, with the quote “STATE OF MIND”. Although it’s only a small feature, it really adds a distinct sense of originality, because it sets this NYC design top apart from any others I’ve ever seen. This crop top would also look great with a pair of ripped jeans and Converse – still keeping it casual. tight. I would definitely recommend you get yourself a pair or two of these leggings. They’re game changers. I’m loving this black faux suede wrap choker.. Wow. It completely changes the outfit, and it looks lovely alongside the black and white look I was going for with this outfit. I was very kindly given this choker by Lamoda as part of a goody bag that I was given at the fabulous Blogging Gals event back in November. I’ve never owned a choker like this before, and I’m not gonna lie, I had to look up how to put it on… I didn’t realise how many different ways you can style a choker like this, and I love its versatility and ability to be able to change the look of an outfit, simply by adjusting the way you tie it! Bomber jackets are huge this time of year, and they are one of the easiest ways to change the look of an outfit, from simple to chic. This black bomber jacket is ideal to wear in the colder months, as it’s perfect for keeping you warm (which has a lot to do with the fluffiness inside), but still looking stylish and on trend. This black jacket goes effortlessly with so many outfits, it’s no wonder why it’s one of my favourite bomber jackets that I own. These Adidas Superstars have a minimal and simplistic design, but they also have an edgy touch to them, which is why I love them. They’re really comfortable and can be worn with pretty much anything, whilst still looking insane. 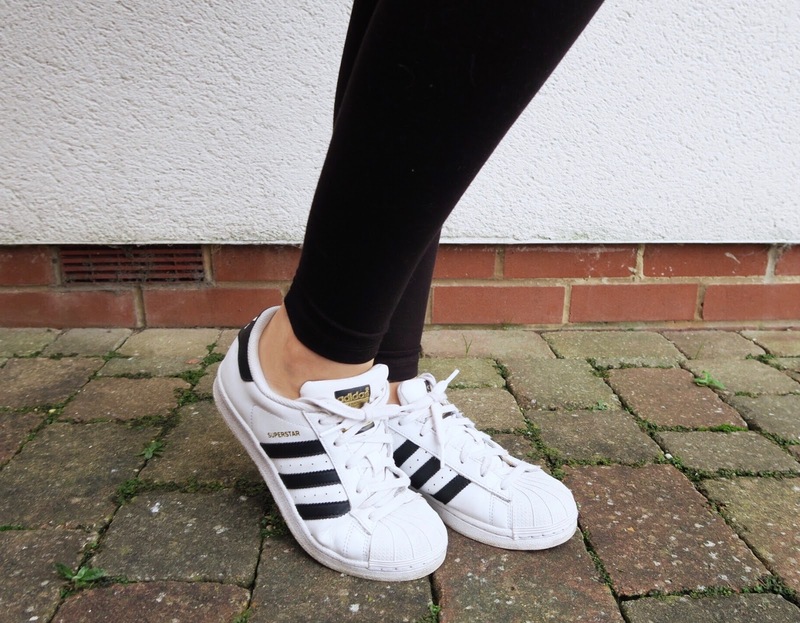 I paired these with some black leggings for a sporty and casual look, but these trainers would also look fantastic with a pair of skinny jeans or denim shorts – the options are endless.